Over the last year, this blog has released several excerpts from the unpublished draft of Terry’s final book, of which he was nearing completion when he passed away in October 2017. It is currently being edited– for anticipated release sometime in 2019– and this week’s post is another exclusive excerpt from his book. This post is adapted from an early chapter of the book, entitled “How To Swim Efficiently.” In this piece, Terry details the origin and evolution of T.I. techniques; their foundations in the laws of physics, fluid dynamics, and biomechanics; the characteristics of an efficient swim stroke; the T.I. 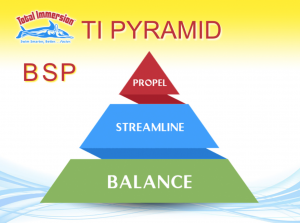 “Pyramid of Skills”; and how our approach has been refined over 30 years and thousands of swimmers. Terry also discusses the ease and grace that is typical of the T.I. stroke, noting the popularity (9+ million views) of a YouTube video of TI Japan Founder and Master Coach Shinji Takeuchi demonstrating T.I. freestyle. 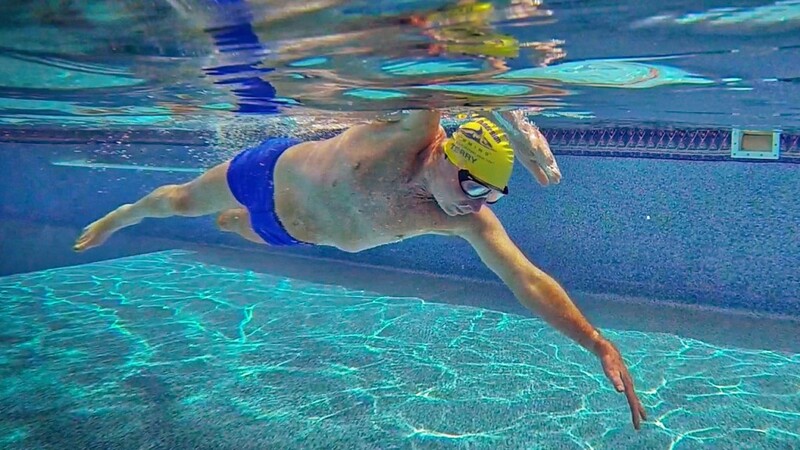 If you’ve never seen this remarkable video, we’ve embedded it– and another brief video demo by Terry of the “Elements of Effective Swimming”– within this article as vivid illustration of impeccable technique. Enjoy… and Happy Laps! Five-time Olympic running coach Bobby McGee refers to running as “primal” – something we do well by nature. ChiRunning founder Danny Dreyer talks of helping runners rediscover the instinctively relaxed and efficient way they ran as children. Swimming is precisely the opposite: As you read in the last chapter, in the water we become energy-wasting machines. To develop a high-efficiency stroke, you must make a conscious choice to eliminate energy waste—and renew that choice every time you swim. You’ll need patience and persistence to resist a return to old habits so that new ones can take root. This chapter details the origin and evolution of TI techniques; their foundations in the laws of physics, fluid dynamics, and biomechanics; and how they were refined over 30 years and thousands of swimmers. While the efficiency principles described here apply to all strokes, this book focuses primarily on freestyle. When you’re at the pool, what kind of swimming catches your eye? A swimmer going fast, or one who swims with consummate ease and grace? On YouTube, the most popular swim video [embedded below] is T.I. Coach Shinji Takeuchi’s “Most Graceful Freestyle,” which has been viewed more than 9 million times since it was posted in 2008. In second place, with some 5 million views, is a video of Michael Phelps which was posted a year earlier. Why are so many more people interested in watching an unheralded, middle-aged man than the most decorated swimmer ever? Could it be because grace is a much rarer quality in swimming than speed? And yet—as Shinji, and thousands of other TI swimmers, have shown—grace is attainable, while Phelps’s kind of speed is available only to those with youth, strength, and special talents? You’ll see countless references to efficiency in these pages. Think of grace as a warmer word for efficiency—and one that’s more accessible. While few of us feel qualified to assess a swimmer’s efficiency, we know it when we see it because all of us feel comfortable recognizing graceful movement vs. ragged or ugly movement. With human’s baseline efficiency at just 3 percent in swimming, there are nearly limitless opportunities to improve it—with the result of swimming any distance with far more ease and enjoyment, while taking far fewer strokes. Balanced: You feel well-supported by the water—even weightless. This is the characteristic that enables those that follow. Long: You travel more than the length of your body on each stroke cycle (right plus left arm). When you do, your hand will exit the water, at the conclusion of each stroke, about where it entered. “Slippery”: You fully extend your bodyline on each stroke, and minimize bubbles, noise, and splash in your stroke. Integrated: You take each stroke with your whole body—limbs, head and torso–working in seamless coordination, not disconnected parts. Relaxed: You appear relaxed—never strained–even while swimming at a brisk pace. And finally, you always feel great while swimming—and better after swimming than before. Prior to 1990, I spent nearly two decades coaching club and college swimmers in their teens and early 20s. My highest-performing swimmers-–especially those who won national championships or achieved world rankings—had the best-looking strokes. That motivated me to prod all my athletes to swim with the best form possible at all times. In maintaining high technique standards for my athletes, I had the luxury of coaching a group of just 15 to 25 swimmers six days a week. And finally, these swimmers were all from the rarefied group “inside the bubble” who—seemingly from birth—were very much at home in the water. In the early 1990s, I faced a challenge for which all these years of experience had left me unprepared. At each T.I. weekend workshop, some 20 or more inexperienced and mostly self-coached swimmers showed up seeking instruction. We had just two days to prepare these new swimmers to successfully coach themselves. Using Bill Boomer’s insights as a starting point, T.I. workshops became a laboratory for refining an all-new approach to improving technique. Learning three skills—in a particular order—has proven to be virtually a sure thing in learning to be efficient. It helps to view these skills as a pyramid. Balance provides the body control and mental calm essential to learning every skill that follows. Learning Balance replaces the sinking sensation with a comforting sense of feeling ‘weightless’. You accomplish this by working with—instead of fighting—gravity. Streamline skills come next because water is 880 times denser than air. Why waste energy trying to overpower water resistance when you can reduce it quickly and with relative ease? You accomplish this by shaping your vessel to slip through a smaller ‘hole’ in the water—and by using your limbs as much for minimizing drag as for creating propulsion. Propulsion skills follow the others because they require a stable body, a high level of coordination, and keen self-perception. Yet you can learn them with striking ease after establishing Balance and Streamline skills. You accomplish this by originating power and rhythm in the core and by propelling with your whole body, not your arms and legs. As energy-wasting machines, we must consider the energy cost of every aspect of swimming—starting with our learning process. Balance skills focus on relaxing, floating, and extending. These require virtually no energy and lead to immediate, significant energy savings. As well, balance is the key to swimming at the equivalent of a runner’s easy “conversational” pace. You could well be swimming farther after 10 to 20 hours of balance practice than following months of endurance training. Streamlining skills—lengthening and aligning the body– require only slightly more energy than those for Balance. And, because drag–and the power needed to overcome it–increases exponentially as you swim faster, minimizing drag will make your energy savings exponential. Propulsion actions—those that move you forward—indeed have a greater energy cost than those we use to balance and streamline. We reduce that by using natural forces—primarily gravity and buoyancy—before generating force with our muscles; and by propelling with the whole body, rather than fatigue-prone arms and legs. Avoid Failure Points. One of Tim Ferriss’s key strategies for meta-learning is to avoid common “failure points” at the start. For newer swimmers, the two aspects of swimming most likely to defeat you before you’ve barely begun are kicking and breathing. T.I. technique is explicitly designed to minimize reliance on kicking. And we introduce breathing only when you have the body control and comfort in the water to handle it with aplomb. A Glimpse of Success In The Power of Habit, Charles Duhigg writes that, to replace an undesired habit with an improved one, experiencing a “small win” early provides motivation to persist through challenges you encounter later. The T.I. learning sequence starts with Balance skills, which reveal how it feels to glide weightlessly and effortlessly. For adult novices, that experience is liberating– even thrilling—and comes as a ray of hope for those who had felt hopeless before. In the next chapter, let’s move straightaway to learning complete details of the three essential aspects of T.I. Swimming: Balance, Streamlining, and Core Powered Propulsion. Glad you enjoyed this sneak peak of Terry’s final book– you can learn all the skills of efficient freestyle with the Total Immersion Effortless Endurance Self Coaching Course!